By Nancy Badertscher on Wednesday, June 3rd, 2015 at 9:36 a.m.
Georgia Gov. 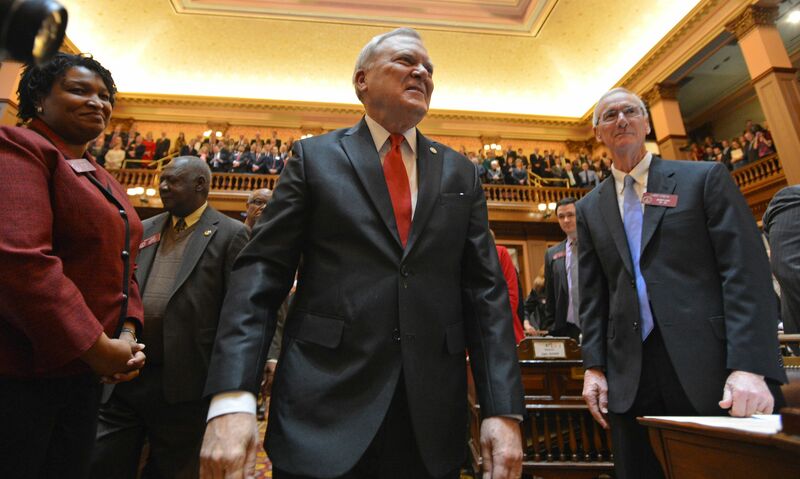 Nathan Deal is welcomed to the House floor before delivering the State of the State speech. Photo Credit: Brant Sanderlin/AJC. Violence Policy Center on Monday, Sept. 8, 2014, in an annual study: Georgia ranks No. 9 in the rate of women murdered by men. In September, the Violence Policy Center issued a report showing Georgia ninth in the nation for one very specific crime: women murdered by men. The center based the ranking on data from 2012, the last year for which data are available. It showed the homicide rate of 1.66 per 100,000 women in Georgia. Nationally, the rate was 1.16 per 100,000 women. "We call on Georgia’s lawmakers to make it an urgent priority to keep guns away from domestic abusers and protect women from harm," Kathryn Grant, a co-founder of GunSense Georgia, said in a statement related to the study. The Federal Bureau of Investigation’s Supplementary Homicide report showed Georgia had 102 homicides in 2012, 19 percent more than the 84 tallied in the Violence Policy Center report. The VPC’s study has a lower overall number because it takes that data and then weeds out crimes with more than one victim or perpetrator. The numbers are right, but it’s also true that there is more to the story. Nathan Deal on Wednesday, Jan. 14, 2015: Since Gov. Nathan Deal took office in 2011, the state’s rainy day fund has grown by 643 percent. Rebuilding the state’s reserve or rainy day fund is something Gov. Nathan Deal likes to crow about. In his 2013 State of the State address, the governor bragged that the rainy day fund had grown 226 percent since he took office in 2011. His staffers were all atwitter about it then on, um, social media. The news this year, Deal said in his annual speech, was even better: now up to 643 percent over 2011. The unflappable AJC Truth-0-Meter started spinning. Georgia’s rainy day fund had $116,021,961 before Deal took office in 2011 and reached $377,971,440 by June 30, 2012, earning the governor a True rating from PolitiFact for his statement in the State of the State address in January 2013. By June 30, 2014, the end of the last fiscal year, the fund had $862,835,447, which makes his math correct. We rated Deal’s statement True. Allen Peake on Wednesday, Dec. 3, 2014, during a press conference at the Georgia State Capitol: Unlike marijuana, medical cannabis oil cannot get you high. One of the more emotional debates to come before the Legislature in recent years dealt with whether to legalize medical marijuana for treatment of certain medical conditions -- mainly seizures in children. For the 2014 session, state Rep. Allen Peake, R-Macon, revived a bill to allow the use of cannabis oil made from marijuana plants for treatment of certain seizure disorders and other health problems. But state Sen. Curt Thompson, D-Tucker, is proposing a competing bill that would allow vaporized, edible or smokable marijuana. Thompson also filed a resolution calling for a statewide referendum on whether to authorize recreational use of the drug. Confusion about the oil form versus a smokable drug prompted Peake, who said he does not support expanded use, to speak out. "We believe that the medical cannabis oil – very low in THC, that doesn’t have a psychoactive component to it, cannot get you high – is a better approach for our citizens," Peake said during a press conference. None of the existing studies or anecdotes from parents acknowledges or reports any "high" from cannabis oil. Marijuana remains officially a more dangerous drug than cocaine, according to the federal government. But the main component of the plant used to make cannabis oil doesn’t have the mind-altering, munchies-inducing effect associated with street use of the plant. Allan Levene on Saturday, Nov. 20, 2013, in an article: Says there’s no language in the U.S. Constitution that prevents someone from running for Congress simultaneously in multiple states. Crazy. That’s how one constitutional expert described Cobb County resident Allan Levene’s plan to simultaneously run for the U.S. Congress in Georgia and three other states. "I may be crazy like a fox," Levene, a Republican, told us by telephone. Levene, who lives in Kennesaw, recently posted an article on his campaign website claiming the U.S. Constitution does not prevent him from carrying out plans to run for Congress from Georgia, as well as Hawaii, Michigan and Minnesota. Levene said he believes he can run in numerous state primaries without living in those states. Were he to win a primary, he would have to establish residency in that state to be on the general election ballot, he said. Experts we contacted agreed, including University of Texas law professor Joseph Fishkin. "I think the guy is basically right about the main point -- that you don’t have to live in the district when you put in your primary bid -- just when you win the election," Fishkin said. University of Virginia law professor Dan Ortiz said he didn’t think "there’s any constitutional problem there." "It’s crazy," he said. "It’s politically a crazy strategy." Review of state rainy day fund records. Allan Levene, "Running for Congress in four states," Nov. 2, 2013. Atlanta Journal-Constitution Political Insider, "Running for Congress, in Georgia and three other states -- at the same time," Nov. 6, 2013. Georgia Secretary of State Nov. 6, 2012, election results.